Like many small Episcopal Parishes, St. James cannot support a full time priest. So we depend on supply clergy from the diocese. We have been very fortunate in this regard. Many very dedicated members of the clergy have worked very hard to see that our spiritual needs are being met. For the second summer in a row, that minister has been Father Arthur Hadley. He is also the author of all of the wonderful sermons you've been reading here lately. Arthur Hadley was ordained to the priesthood on St. Barnabas Day, 1963, in Indianapolis, Indiana. After serving in the Diocese of Indianapolis, Fr. Hadley went on to serve as the Bishop's Deputy in the Diocese of Missouri, Canon to the Ordinary in the Diocese of Northwest Pennsylvania, and later served in the Diocese of Southern Ohio. Fr. Hadley and his wife, Jane, have two sons, both of whom are now grown up and out on their own. The Hadleys make their winter residence in McAllen, Texas. 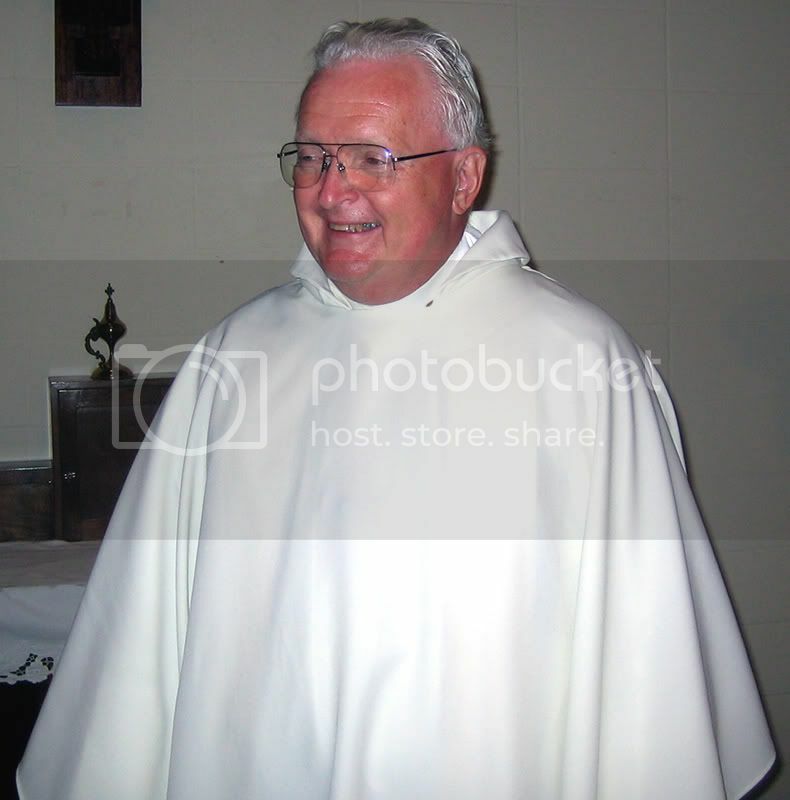 During those months Father Hadley serves the Diocese of West Texas. But during the summer months they make their home near Howe, Indiana. So St. James is blessed to have the ministry of Fr. Hadley from around May until, as Father puts it, "It's getting cold here and the temperature in McAllen drops below 100". Usually sometime in October. We are indeed thankful for the ministry of Father Hadley. If you enjoy reading his sermons on the website, you ought to try stopping by the church some Sunday morning and hearing one in person. In the Gospel, just read, Jesus explains what we can and should not expect when we answer the call of Follow Me. In the story about the Apostles, Peter, James, Andrew and John being called to follow Jesus. They had been fishing in the Sea of Galilee, and responded to Jesus’ call to follow him, by immediately leaving their boats and nets and following Jesus. But in the story today when a person is asked to be a follower, that fellow responded that first he had to go and bury his father. The call is to be answered immediately. No time to wait. It is not acceptable to say well ok I will follow Jesus later, after my parents have died and buried, after I have done lots of things in life, then I will answer the call. In the middle ages it was customary to be baptized on your deathbed, so you could live a very sinful life. And just before you died you could be baptized with all the sinfulness forgiven, and then die. Not really very good theology. A little risky if you died before baptism, or recovered and lived. Nor is it a good understanding of Christian Forgiveness. Jesus died for the sins of the world -- all sins, everybody’s sins. That is the point Paul has been pounding for the past several weeks in the Epistle to the Galatians. Sins have been forgiven. Been there; done that. Because sins have already been forgiven we live by Grace not by trying to keep the Law in order not to sin. In the Old Testament the theological premise is fairly simple: be good, that is follow the Law, and good things will come to you. But if you do not keep the Law, be bad, bad things will happen. Sometimes the punishment for being bad might not happen to you, but to your children, or grandchildren. And if the nation did not keep the Law, bad things would happen to the nation. If you want to follow that line and look at our nation where our national governmental leaders do not even follow the laws and regulations of our government, you can make all kinds of dire predictions of our future. But that is not where I want to go today. Look at what Jesus says about being one of his followers. Foxes have their holes, but the Son of Man does not have a place to lay his head. There is no guarantee that following Jesus, accepting a life of forgiven sins, will be easy. No guarantee that by following Jesus you will have a home, and trouble free life. This is a radical shift from the Old Testament theology. Of do good and have an good life, do bad and have a bad life. Following Jesus does not guarantee a easy life. In fact Jesus says, Pick up your cross and follow me. Pick up the pain and suffering of the world, even if you are homeless, a refugee, sick, or in prison; Pick up your cross and follow me. Where did Jesus go with his cross? To death outside the gates of Jerusalem beside the main road to Jericho; buried in a garden tomb in the stone quarry when the stones of the temple had been taken, Buried in the stone that the builders had rejected. And where did he go? He descended into hell, and the third day, he arose from the dead. And where did he go? Forty day later he ascended into heavento sit at the right hand of God the Father. If we try to live by Law, we are condemned by the law. But we live by Grace where the sins of the world are forgiven - all sin, everyone’ sin. We are all equal as forgiven children of God, joint heirs of the resurrection. We are not Jew or Gentile, slave or free, male or female, we are all children of God, a part of the risen Body of Christ. We pick up our cross and follow Jesus, just as the thief crucified along side Jesus, and Jesus said to him Today you will be with me in Paradise. In this morning’s Gospel we heard Jesus ask the central question of Christianity. “Who do you say that I am?” The Gospel of Luke tries to answer the great question several ways and several times. The Gospel opens with the Annunciation to Mary that she will conceive and bear the Son of God, the Messiah. Mary goes to visit her cousin Elizabeth, who is also carrying a child who became John the Baptist. Elizabeth understood that Mary’s child would be the Messiah. At the birth of Jesus, the angels told the shepherd out in the field near Bethlehem. The story of the Kings, or Magi, is in the Gospel of Matthew. In Luke the women, Mary and Elizabeth know, and shepherds know. But women and shepherd can not give testimony; they can not be trusted to know anything. But we as readers and hearers of the Gospel are in on the answer to the question, Who is Jesus. The first hints are in the early ministry of Jesus. First he is a teacher in Nazareth, but the people of Nazareth rejected him and his teachings. So Jesus of Nazareth moved down the hill to the more cosmopolitan city of Capernaum on the north shore of the Sea of Galilee. There in Capernaum, Jesus continued his teaching in the synagogue, and began to gather his disciples. First Jesus was a Teacher. As people began to listen to his teaching, then Jesus began to do more than teach. The Gospel of Luke shows Jesus doing a series of healings. Second, Jesus was a healer. The Jesus does some unusual things…He chooses Levi, the tax collector to be a follower. Tax collectors worked for the Roman occupiers and were considered by the Jewish people to be traitors, sinners and shunned. And Jesus worked on the Sabbath, by picking a few heads of wheat or barley to eat. He openly broke one of the ten commandments, Keep Holy the Sabbath Day. The Sabbath is Saturday, the last day of the week, God created all in six days and on the seventh day He rested. What did you do yesterday? Good thing we are not expecting to be saved by keeping all of the Law. Third Jesus was revolutionary. When John the Baptist was imprisoned he sent two of his disciples to Jesus with the question: “Are you the one who is to come, or are we to wait for another?” Jesus answered the question by saying look at the works I have done. Each of the healings were ones done by the Prophets of the Old Testament: blind see, the lame walk, leapers cleansed, deaf hear, dead are raised to new life, the Good News in proclaimed to the poor; happy is the man who does not lose faith in me. John the Baptist proclaimed Jesus as the one for whom they have been waiting. Jesus asked his disciple: who do you say that I am? They bumbled around, Some say you are one of the prophets of old, some say you are like John the Baptist. And Jesus asked again, But who do you say that I am. As long as we answer the question by saying some say you are a: teacher, healer, prophet or even like John the Baptist, we fail the answer the real question. Who is Jesus. Peter gave it a great try: you are the Christ of God. In the Christian Calendar of Saints, John the Baptist is honored with the longest day of the year, for shedding the first and great light on the identity of Jesus, the one for whom we have waited. So who do you say Jesus is? Some say… My Grandmother says… My priest says…. But who do you say He is? On Monday, June 25th at 6 p.m., we will celebrate the Feast of the Nativity of Saint John the Baptist with Solemn Evensong. Chuck has invited the Freemasons of Goshen. We will also be inserting an ad in the Goshen News inviting the general public. Since some area Episcopal Churches may not be celebrating this occasion, I am inviting Elkhart, Bristol, and Syracuse. I am arranging a group of people to sing and lead the Magnificat, Phos Hilaron, Nunc Dimittis, and other beautiful hymns of the Anglican Church. It will be a lovely hour of scripture and music. Let’s all turn out as a Parish for this special time together. Since we are inviting the Freemasons, the general public, special singers, and other Episcopal parishes, it would be great to have more of St. James’ people than visitors! Please come and be blessed by this service. It is a wonderful opportunity to feel and experience the presence of God, and to present it to our visitors in a very "Episcopal" way. From the Gospel according to Luke we just heard a story about Jesus going to the home of a Pharisee for dinner. In those days people walked in the dirty dusty streets along with the donkeys, oxen, and even camels. So even though guests would leave home all cleaned up for dinner, by the time they walked to the host’s home the feet were not too clean. The host usually provided a servant or child to wash the feet of the guests. In those dirty, dusty, animal shared streets were lots of other folks - beggars, pick pockets, soldiers, and women trying to make a living in a world where women rarely owned anything. As children women were wards of the their father, as wives they were property of their husbands, as widows they were wards of their sons. If there was no father, husband, or son, good luck maybe a brother, brother in law or uncle would take the widow in as a servant. Other wise it was the street to beg or to bed. Jesus is at dinner in the Pharisee’s home, stretched out on a couch on his left side leaving his right hand able to reach the table. A person on the right side was the honored guest, the person on you left side could talk to you, but not really see your best side. The host was on the other side of the table. The Pharisee host saw a women of the street come in to the dining area…she had to be allowed in, servants had to know from the host to allow a street women into the house. Maybe she came often? But the host knew what kind of women she was. And the host thought: If Jesus is a real prophet he would know what kind of women was behind him washing and kissing his feet. The test of a prophet. So Jesus was not just at a nice dinner party. He was there to be tested. And Jesus tested the host and gave him a failing grade. As a good host you should have washed my feet, or had a servant wash my feet when I entered you house. But you did not. As a good host you should have greeted me with a kiss of peace, but you did not. This woman of the street is a better host than you are. She has washed my feet with her tears and kissed my feet. Her sins may be many but she knows how to love. Her sins are forgiven. Sins are forgiven, even the woman of the street, the lowest of the lowly. Now look at the Old Testament lesson. The mighty King David and the beautiful Bathsheba have committed adultery, and King David sent Bathsheba’s husband off into battle to be killed in order that David might marry Bathsheba. The prophet calls attention to the sin and asked King David what should be done. The punishment for the sin is visited upon the child of King David and Bathsheba. The child dies for the sins of the parents. God in the Old Testament is seen as a vengeful punishing ruler Sinfulness is punished. The punishment may be immediate or delayed The punishment may fall on the sinner or the children or later generations. Be Good or else God will punish. In the New Testament the Son of God died for the sins of the whole world. Sins are forgiven. We do not live in the Old Testament. We live in the New Creation. Sins are forgiven. Women and Children are not property. All persons: Jews / gentiles, men / women, slave / free are all Joint Heirs With Christ in the Resurrection. Saturday June 9th is Parish outside clean-up day. Please sign up for whatever time you can give between 9:00AM and 12 noon. Inside clean-up day will be June 23. Mark your calendars!